In OED2, soul-mate was listed under soul, n., along with other compounds, such as soul carrier, -curer, -thief, and -twister. 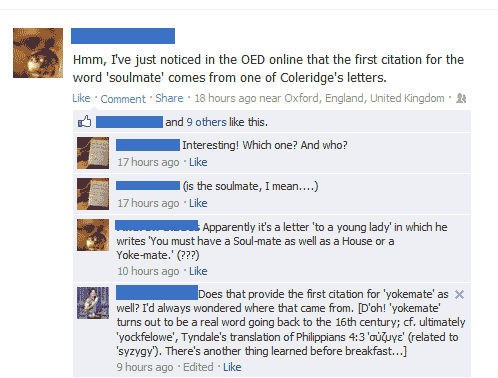 The new OED3 Online gives it its own headword, soulmate, n. and updates the Coleridge quotation to what you see above (whereas OED2 had the slightly different “You must have a Soulmate as well as a House or Yoke-mate.”). Coleridge’s neology is pretty good, but the analogy is a bit fuzzy. 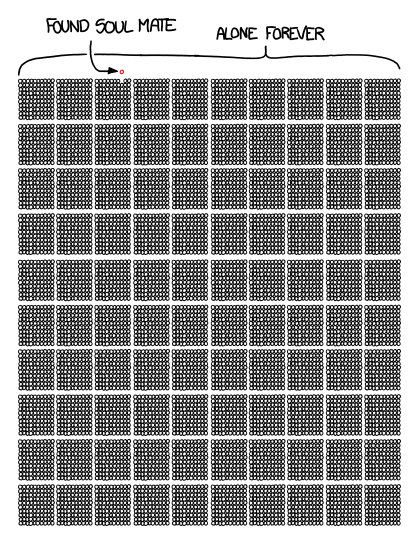 A house mate shares your house; And two things that are yoked are indeed paired – a yokemate is just the other term in a pairing, even if the idea of the yoke also carries a connotation of a shared burden (and in fact yokemate gets reused in English in exactly this kind of figure: “1581. Neyther may they bee ioyned as yokemates, to drawe in the vineyarde of the Church”; though the idea is originally just “pairedness”). But in soulmate, a soul isn’t the coupling agent, nor does a soulmate help you bear the weight of your soul, nor do you and your soulmate share a soul. Rather your soul finds an ideal companion in the soul of the soulmate. The two souls are companions to each other on the ethereal plane, just as the bodies are companions on the earthy plane, two terms sharing the burden of life, and the space of a house. As the FB commenter says, this all goes back to the Greek for pair, couple, coupling. Syzygy in English means a conjunction of heavenly bodies, or a pair of opposites, or the joining of different kinds of feet in a poetic meter. It is from the same Greek root as zeugma, meaning a yoke, or pairing, or conjunction, and also a copulation. But copulation-mate (= mating-mate?) is somewhat less romantic than “Yoke mate”, which is lovely. In the KJV, Phil 4:3 goes like this: “And I intreat thee also, true yokefellow …”. Today’s NIV has “my true companion,” which is not quite as lovely. Wycliffe has “german fellow,” which might make you scratch your head a bit (until you find the Vulgate is germane conpar). The New Living goes for “true teammate”, which might have been a good idea in theory (a “team of oxen” obviously on their mind) but turns out just omg awful. The God’s Word translation treats the epithet as a personal name: “Yes, I also ask you, Syzugus, my true partner.” In other versions it comes out as “sincere companion”, “loyal friend”, “faithful friend”, “true helper in my work”. No one has yet come up with soulmate, here. 1673 Dryden Marr. à la M. iv. i, If ever woman was a help-meet for man, my Spouse is so. 1722 De Foe Relig. Courtsh. ii. i. (1840) 187 A woman is to be a helpmate, and a man is to be the same. Vi heþen kinges driuen hardi..For to ȝeuen hem her mat.